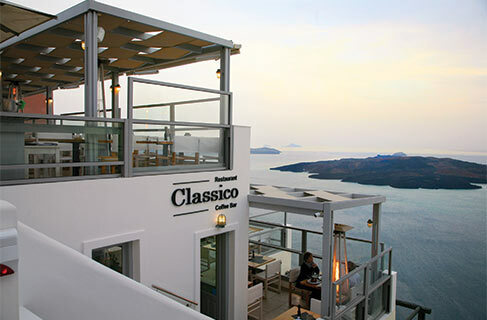 Classico at Fira is now serving delicious tastes inspired by the Mediterranean cuisine with stunning caldera views. On Kamari Beach now Classico stands out for its comfortable space and delightful tastes. Both open early in the morning serving coffee and breakfast and go on with a wide variety of appetizers, salads and full menus -offering also a breathtaking view over the endless blue of the Aegean. The chef’s virtuosity combined with the full fresh raw materials result unique culinary creations that will fully satisfy you.